To finalize the failover process, you can permanently fail over to the VM replica. When you perform permanent failover, you “commit" failover. You can perform this operation if you want to permanently switch from the original VM to a VM replica and use this replica as the original VM. As a result of permanent failover, the VM replica ceases to exist as a replica and takes on the role of the original VM. The permanent failover scenario is acceptable if the original VM and VM replica are located in the same site and are nearly equal in terms of resources. In this case, users will not experience any latency in ongoing operations. Veeam Backup & Replication removes snapshots (restore points) of the VM replica from the snapshot chain and deletes associated files from the volume. Changes that were written to the snapshot differencing disk are committed to the VM replica disk files to bring the VM replica to the most recent state. Veeam Backup & Replication removes the VM replica from the list of replicas in the Veeam Backup & Replication console. 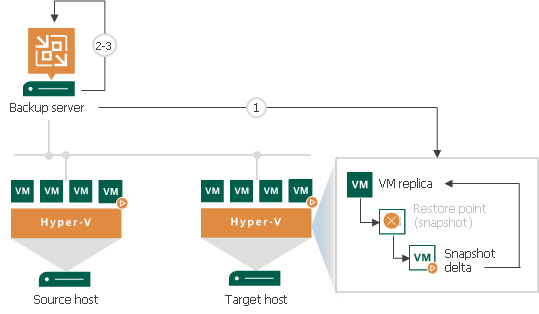 To protect the VM replica from corruption after permanent failover is complete, Veeam Backup & Replication reconfigures the replication job and adds the original VM to the list of exclusions. When the replication job starts, the original VM is skipped from processing. As a result, no data is written to the working VM replica.